Diana Bayani currently leads the recently established HTA Unit in the Philippine Department of Health (DOH). Prior to her assignment in the DOH, she was a visiting scholar at the Global Health and Development Group at Imperial College London while she was finishing her postgraduate degree in Health Policy, Planning and Financing at the London School of Hygiene and Tropical Medicine and London School of Economics and Political Science. 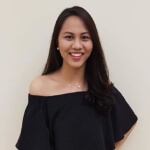 She is also a part-time lecturer in health economics, health financing and economic evaluation with the Health Sciences Programme in the Ateneo de Manila University.